Happy Friday peeps! 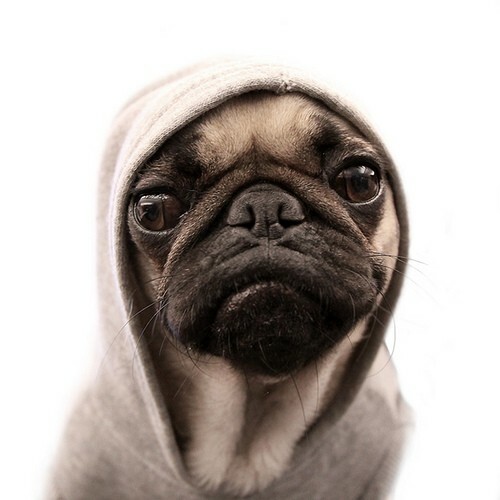 Can I just talk about this amazing thug pug picture for a second? Ummm, hello! I would like a thug pug. Or a thug cat. I may just have to look for a little cat hoodie! What is everyone’s weekend looking like? I’m excited for some spring cleaning! Yes, I get excited to clean — well, sometimes. We’ll be donating lots of clothes and things to good will, rearranging our living room and purchasing some new furniture. I’m pumped — boyfriend — not so much. Oh, I’ll also be preparing for the bachelor season finale party that I’ve put together for Monday. I’m thinking chocolate covered strawberries and champagne. If you’re in NYC give me a holla and I’ll send you the invite. Ok, I’ve used up my ‘thug’ talk for the day. Happy weekend! Starbucks re-branded. Thoughts? I’m still getting used to it! Custom beer pong table — perfect for the man room. Have you seen the H&M Conscious Collection ? Excited for is to hit stores! If you knit, you’ll love this Herringbone Cowl. Got Bangs? A great blowout tutorial you don’t want to miss. Sugaaarrrrr Ugh, you may want to re-think your drink options. My kitty would like this funky pillow. How would it feel to wake up in the morning, look out your window and see a big giraffe staring back at you? Find out. 25 great fonts for free! Cute ‘sailor’ jeans via the Gap. Hope you're having a great weekend and looking forward to following along! I love the sailor jeans. Definitely on my list for spring.